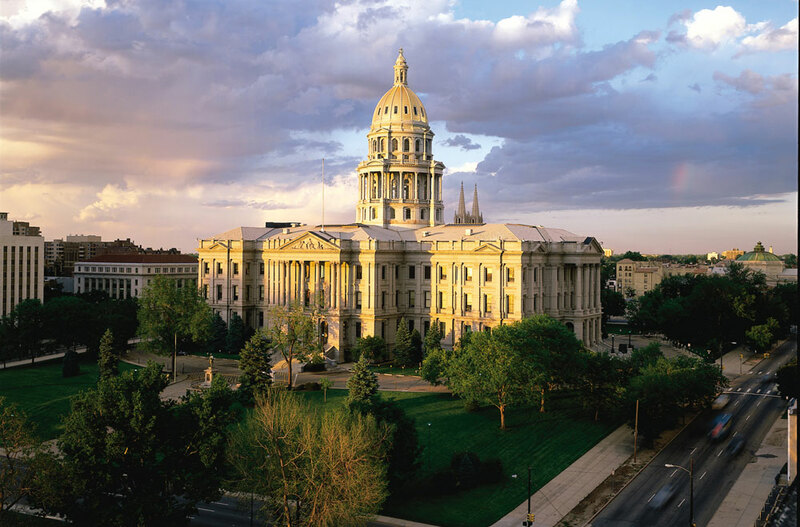 The golden-domed Colorado State Capitol is one of the prominent features in Denver's skyline. The Neoclassical building, which sits at the eastern end of Denver's Civic Center Park, serves as a sort of museum to Colorado history, and free tours of the capitol are offered Monday through Friday. One of the best spots to visit inside the capitol is Mr. Brown's Attic. This exhibit area is dedicated to Colorado history, details of the capitol's construction, a space for kids and other interesting details about the building. The building is made from Colorado rose onyx (also known as Beulah red marble), a type of stone so rare that all known reserves were used in the capitol’s construction. The Colorado rose onyx itself was quarried in the town of Beulah, Colorado. The capitol's original signature dome was made of copper, but was swapped out for gold in 1908 due to the copper’s tendency to oxidize, creating a dull patina cover. The dome was plated with 200 ounces of glistening 24-karat gold leaf to commemorate the Colorado's Gold Rush and the brave pioneers and miners who helped build Colorado. Three reapplications of the Colorado gold leaf occurred between 1908 and 1980 — the newest golden shine now comes from 65 ounces of .999 pure gold that was mined in Colorado, hammered into gold leaf in Florence, Italy, and applied in 2013. Free historical tours of the capitol building are offered 10am to 3pm Monday through Friday. Walk-ins are welcome. Reservations are required only if you are planning to tour the building with 10 or more members, are part of a senior citizen group, school, day-care center or have a disability. The House and Senate chambers are open to the public from mid-January through mid-May, Monday through Friday. Gallery guides are available to provide information on the chambers and the legislative process. Legislative tours, which may include historical and dome tours, are offered for school groups late August through early May (reservations required). The Colorado state capitol building sits at exactly one mile above sea level. On the western entrance’s 15th step you’ll notice the inscription “One Mile Above Sea Level.” Don’t be fooled, though. This is not the true one-mile marker. The inscription was made based on measuring techniques from 1909, by students of the University of Denver. Originally, a brass cap was installed to commemorate this first measurement, but after the cap was stolen seven times in a matter of 38 years, the state carved the claim into the stone step itself. In 1969, engineering students from Colorado State University re-measured the distance and found it was slightly off. To compensate for the discrepancy, they installed a brass plaque two steps higher — however, their measurement was off as well. Finally, in 2003, college students from the Metropolitan State College of Denver re-measured the height, and in a dedication ceremony that same year, Governor Bill Owens placed the official marker on the 13th step — the true mark of one mile above sea level. When you're done there, take a free tour of the Denver Mint (Monday through Thursday; reservations required). Or head a couple blocks down Broadway to the History Colorado Center, across Civic Center Park to the Denver Art Museum or toward 17th and Wynkoop to Union Station. Read 24 Hours in Denver and A Day of Arts & Culture in Denver. Learn 8 ways to experience the Centennial State's history and other ways to experience our heritage. Photo: Visit Denver, The Convention & Visitors Bureau/Bob Ash.